Have you ever wondered how much snow falls over an entire winter season? 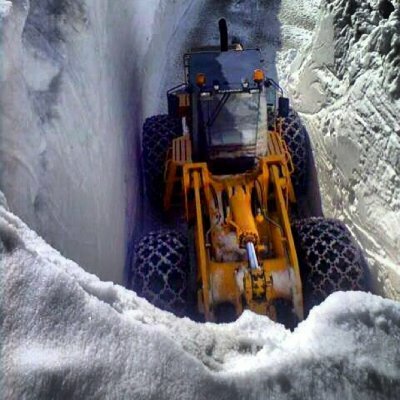 If so, take a look at these pictures showing the operation to clear snow from the Iseran pass high above Val d’Isere. 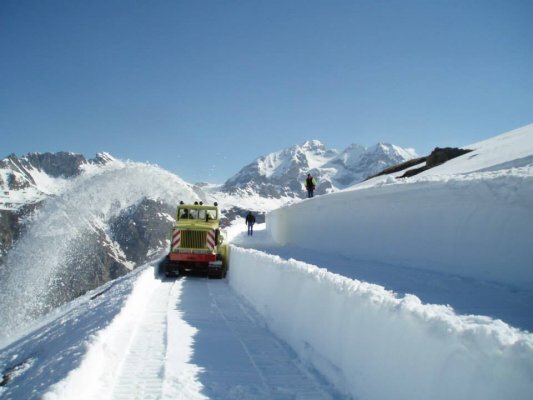 During the winter months the Iseran pass road is used as a pisted run in the Espace Killy ski area, but during the summer it provides a stunning passage through the Vanoise National Park for vehicles, cyclists and walkers. 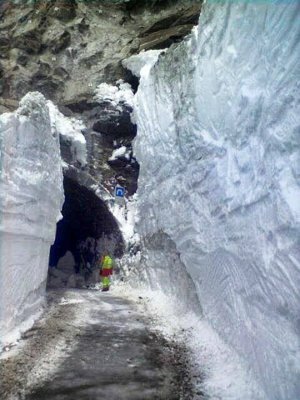 After the winter snow walls of up to 8 metres have to be cleared in order to make this mountain road passable. Large teams of workers use specialist equpiment to move the huge amount of snow and clear the road for the summer. It’s a major operation and a skilled task which can take several weeks to perform. It’s a vital job as well as the Iseran pass provides a vital route into this area of natural beauty.